A long time ago in a galaxy far...actually, scratch that. It's time for another RD80s Watch & Win Review right now at a website very close! From the Star Wars collection at Entertainment Earth, RD80s is giving you an opportunity to win two action figures from the Black Series! One of the hottest selling Star Wars figures at Entertainment Earth is x-wing pilot Ello Asty. This 6-inch Black Series figure from Star Wars: The Force Awakens comes in full uniform with a blaster at his side and fighter helmet. Also included in the giveaway is Luke Skywalker from the 3.75-inch Black Series collection. Fresh off a Wampa attack, Luke comes dressed in his Hoth gear with two versions of his light saber and blaster to reenact the famous scene from Empire Strikes Back. 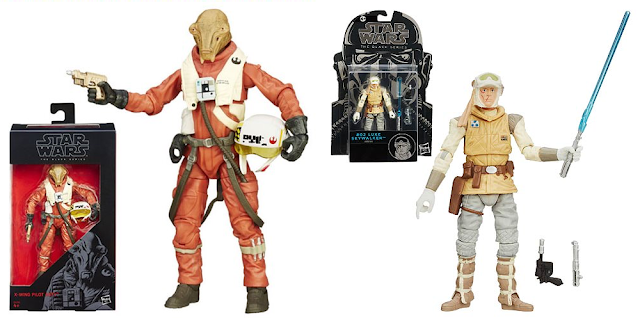 These Star Wars figures are available now at Entertainment Earth! Just visit the links above to purchase or if you are feeling a little lucky, use the Rafflecopter widget below to earn up to 6 entries in the Watch & Win Giveaway. Come back to the widget each day over the next week and tweet about the contest again to earn bonus entries. Deadline to enter is Tuesday October 18 at 12am CST. US residents only. Winner will be announced Wednesday October 19 upon email confirmation. See terms and conditions below for full contest details and rules. Good luck!